You are here: Home / Skincare / Aromatherapy/Essential Oils / It’s Thyme For The Essential Oil Of The Month! It’s Thyme For The Essential Oil Of The Month! Thyme known since ancient times as a medicinal herb, thyme contains large amounts of thymol. As a dietary supplement, it is one of the strongest antioxidants known. Traditional Use: Medicinally known for its antiseptic and disinfectant properties. It is also extensively used as a household cleaner. Benefits: Anxiety, bruises, burns, cellulite, chills, colds, coughs, cuts, diarrhea, exhaustion, fatigue, flatulence, gum infections, headaches, infections, insect bites, insomnia, itching, muscular aches and pains, oily skin, poor circulation, sore throat, sprains, wounds. Topical applications such as balms and ointments may be applied locally. Of Interest: The name has two possible Greek origins. The first being thymon which means to fumigate. This comes from the herb being used as an incense. The second is thumon meaning courage. Thyme was associated with bravery. Essential Oil should not be applied directly to the skin but in carrier oils, putting the oils directly on the skin is too harsh due to their concentrated form. 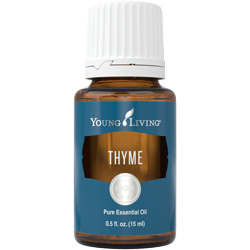 Add a few drops of Thyme essential oil to the carrier oil. « Beauty of the Month: Valentina Cervi!